I was so excited to be on the AT even though I knew it was only for two days. The first thing I passed was a small but tranquil water falls. Then as I walked ahead I saw steep rocks and gnarled tree roots. Now what I haven’t mentioned is that I had both of my knees replaced in 2011 and haven’t done much climbing since. I approached the rocks while trying to convince myself that they weren’t really that difficult. I grabbed onto some roots and up I went. Pheww! Even though small it was my first test and I’d passed. 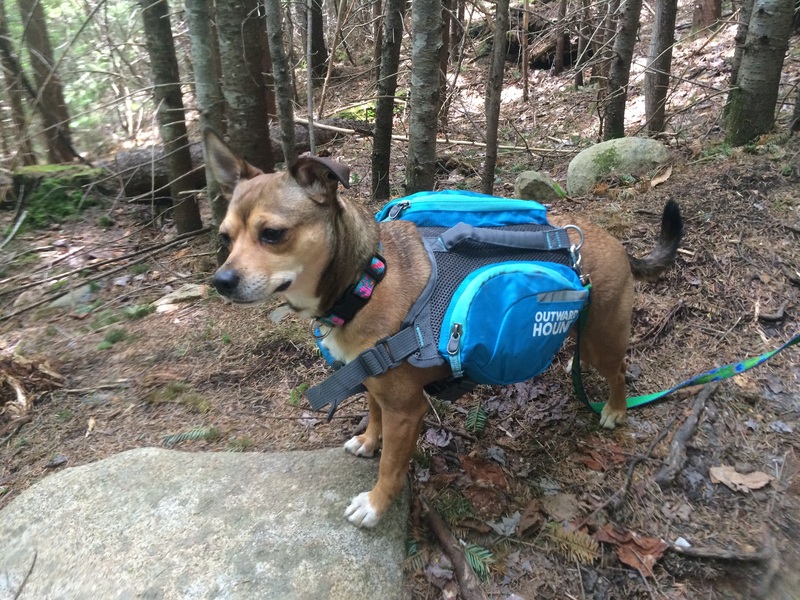 My hiking partner, Bailey B (trail name BB for Baxter Babe) scampered over rocks and roots as if she was frolicking in a meadow. This was her first outing in the forest and she was thoroughly enjoying it. As we walked through the forest I couldn’t help but think about the book that sparked my interest in the Appalachian Trail, Blind Courage. It’s the story of Bill Irwin, a seeing impaired alcoholic who, guided by his service dog Orient, was the first blind person to hike the trail. I thought back to the rocks I’d initially encountered and marveled how Mr. Irwin had navigated not just them, but far bigger and more dangerous obstacles along the way. He was driven by faith; both in God and Orient. I suddenly felt very small and insignificant for having panicked at the sight of a few rocks. I rambled along the trail at my usual snail pace, loving the trees and tranquility. I was a bit surprised to see trees marked with a white rectangular shape as I’d always read about the “white blazes”. Nonetheless they were marked so I knew BB and I were heading in the right direction. Then I saw it – a bog bridge. Now logically I know that should I fall off a log the only thing that would happen is I’d get really muddy. I just wasn’t prepared to play Indiana Jones less than two miles in. Bailey took it in stride, leaving little wet paw prints on the logs. We finally reached the end where the trail exited onto a dirt logging road. We crossed it and continued on the other side. 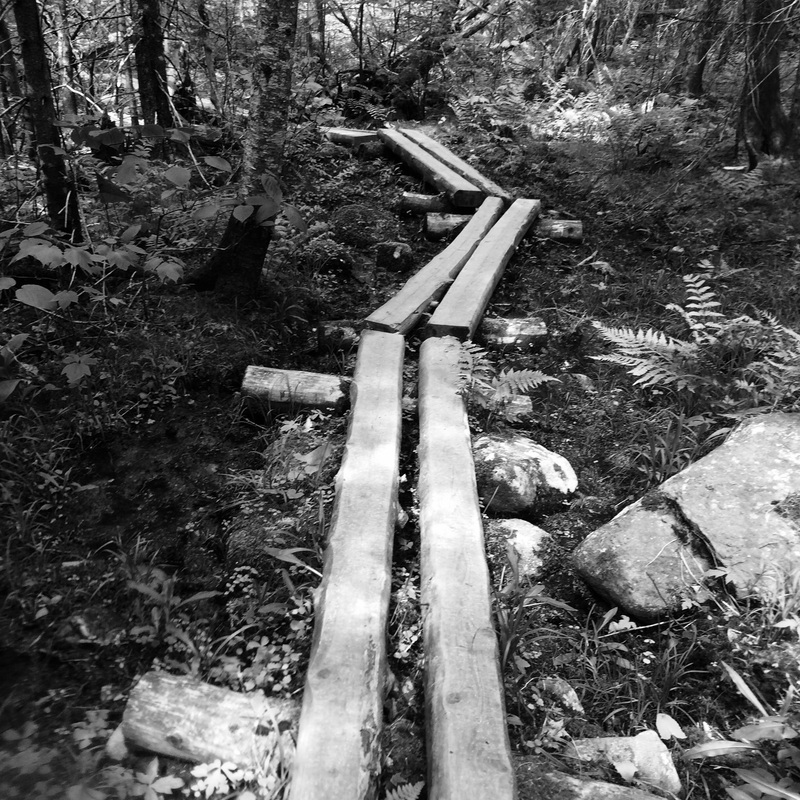 There were more bog bridges but at this point I felt like the Log Lady – I rocked those babies. Soon we came to Piazza Rock, a name I recognized from the trail guide which excited me almost as much as Starbucks.